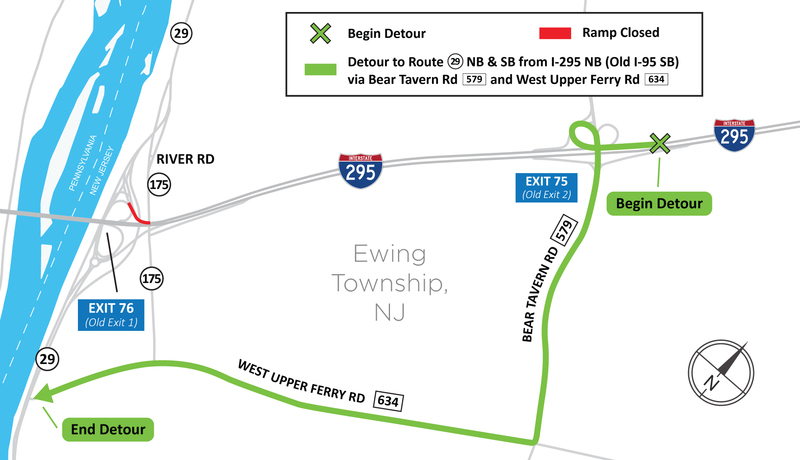 EWING, NJ – Overnight ramp and lane closures with corresponding detours are scheduled to be implemented during overnight hours on portions of the I-295/NJ Route 29 interchange (Exit 76) next week, the Delaware River Joint Toll Bridge Commission announced today. The Route 29 NB bypass roadway also will be closed to traffic during the same overnight time periods. Route 29 NB motorists will be directed to travel through the new downstream roundabout and reconnect with Route 29 NB on the upstream side of the interchange. The ramp and bypass closures are needed to allow for demolition activities on the old approach bridge that carried I-295 (old I-95) across Route 29 NB, Route 175/River Road, and the Delaware & Raritan Canal on the New Jersey side of the Scudder Falls Bridge. The structure is being replaced with a wider, newer structure as part of the ongoing Scudder Falls Bridge Replacement Project. I-295 NB/WB (old I-95 SB) approaching the Scudder Falls Bridge Pennsylvania-bound – Intermittent single-lane travel patterns 7 p.m. to 2 p.m. (next day) Monday, Jan. 7, through Friday, Jan. 11. I-295 EB/SB (old I-95 NB) crossing the Scudder Falls Bridge into New Jersey – Intermittent single-lane travel patterns 10 a.m. to 4 p.m. and 6:30 p.m. to 6 a.m. (next day) Monday, Jan. 7, through Friday, Jan. 11. Route 29 NB bypass – Overnight closure with detour through the interchange and roundabout 10 p.m. to 6 a.m. (next day) Monday, Jan. 7, through Thursday, Jan. 10; and 10 p.m. to 7 a.m. (next day) Friday, Jan. 11. Route 175/River Road – Intermittent alternating single-lane travel may be implemented approximately 6 a.m. to 6 p.m. Monday, Jan. 7, to Friday, Jan. 11. I-295 EB & WB in the vicinity of the Scudder Falls Bridge – Intermittent off-peak single-lane ravel patterns possible for construction along I-295 on the NJ side of the Scudder Falls Bridge Monday, Jan. 7, through Friday, Jan. 11. Taylorsville Road north of I-295 – Intermittent single-lane patterns with possible flagger-controlled travel 9 a.m. to 4 p.m. Monday, Jan. 7, to Friday, Jan. 11. Taylorsville Road south of I-295 – Intermittent single-lane patterns with possible flagger-controlled travel 9 a.m. to 6 p.m. Monday, Jan. 7, to Friday, Jan. 11. Woodside Road – Right or left lane closures with passage maintained in each direction and/or flagging-controlled travel 10 a.m. to 6 p.m. Monday, Jan. 7, to Friday, Jan. 11. PA Route 32/River Road –Intermittent stoppages and alternating traffic controlled by flaggers 7 a.m. to 5 p.m. Monday, Jan. 7 to Friday, Jan. 11. Weekends: No project-related travel restrictions are scheduled for the weekends of Jan. 5-6 and Jan. 12-13. Canal Towpaths: Intermittent weekday daytime closures of the Delaware Canal towpath in Pennsylvania and the Delaware & Raritan Canal towpath are expected in the vicinity of I-295 in Pennsylvania and New Jersey, respectively during the week. The canal towpaths are expected to remain open for public use on weekends. The aforementioned scheduled travel restrictions are subject to change due to weather, emergency, traffic, and equipment/materials mobilization considerations. Motorists are urged to allow extra time to reach their destinations, and to reduce speeds and exercise caution when travelling through project work areas. Copyright © DRJTBC | Site Developed by Stokes Creative Group, Inc.